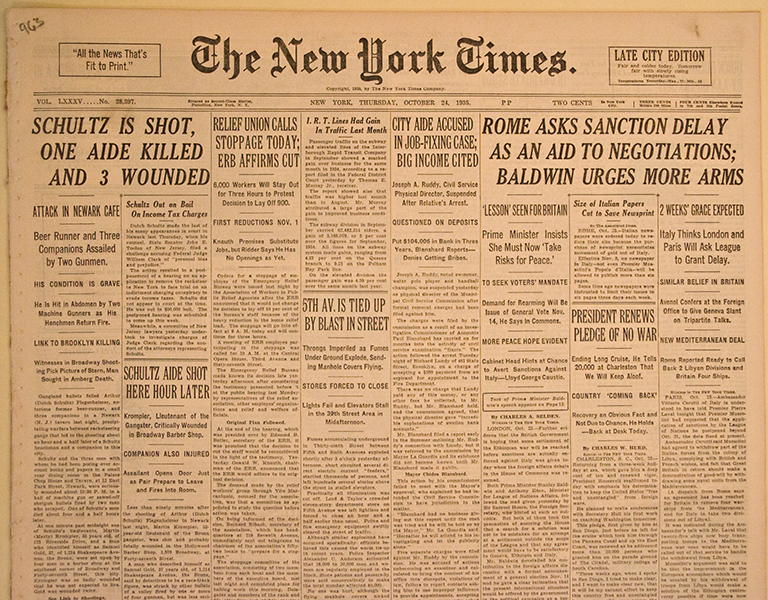 The bold two-line headline screams: “SCHULTZ IS SHOT, ONE AIDE KILLED AND 3 WOUNDED.” “ATTACK IN NEWARK CAFE. Beer Runner and Three Companions Assailed by Two Gunmen. He is Hit in Abdomen by Two Machine Gunners as His Henchmen Return Fire.” The story begins,“Gangland bullets felled Arthur (Dutch Schultz) Flegenheimer, notorious former beer-runner, and three companions in a Newark (N.J.) tavern last night, precipitating warfare between racketeering gangs that led to the shooting about an hour and a half later of a Schultz henchman and a companion in this city.” The lengthy story (and others) continue on page 9 with a nice photo of the notorious gang boss. 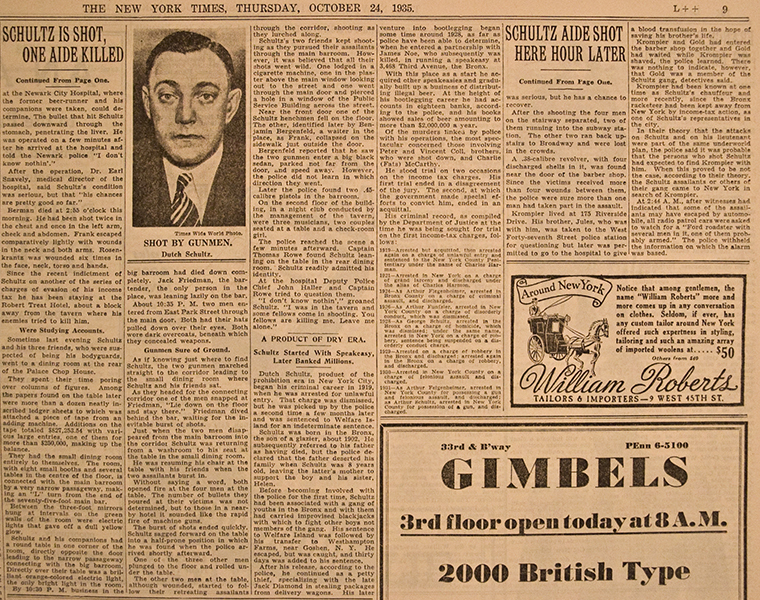 Dutch Schultz and his gang were notorious in the Harlem numbers racket, restaurant extortion, and other forms of organized crime. In the middle of fighting a tax evasion case and being hounded by U.S Attorney Thomas Dewey, Schultz decided to kill the Federal official. The majority of Mafia bosses, however, were against such an idea figuring Dewey’s death would bring the Federal Government down on them all, so they decided to kill Schultz instead to keep him from carrying out his threat. Complete 44-page issue in excellent condition, beautifully printed on enduing white rag paper–only some 90 issues were printed. A must issue for any serious Gangster collection! ADOLF HITLER DEAD IN BERLIN! MICKEY MANTLE HITS THREE HOMERS IN ONE GAME…FROM BOTH SIDES OF THE PLATE!